Gary began his career in 1981 as a junior apprentice in stone masonry. As a self-employed stonemason, he has worked on church refurbishments, barn conversions, house building, and restoration. Gary has qualifications in Heritage skills masonry, brickwork and earthen structures NVQ level 3; Trowel Occupations NVQ level 3; Advanced craft bricklaying; NVQ level 4 PTTLS; Stone carving and design level 2; Assessor Award NVQ level 3. Gary has broad experience teaching and lecturing on heritage work. He currently delivers nationally significant programmes for Masonry within Her Majesties Prisons. AiP is actively seeking sponsors. Join us in saving the valuable Dunans bridge and restoring the "castle". Dunans Castle Ltd is committed to creating a sustainable business that contributes to the betterment of its local community. All profits are invested in restoration of the site, running the company, improving employment opportunities, and making a positive impact on the community as a whole. Through its actions, Dunans Castle Ltd aims to improve local facilities and work with local partners to improve economic opportunities. Importantly, Dunans Castle is also committed to addressing the identified problem of access to cultural events in the area, specifically theater, cinema and museums. As a social enterprise, Dunans Castle will be committed to a program of cultural events aimed at addressing this deficit. 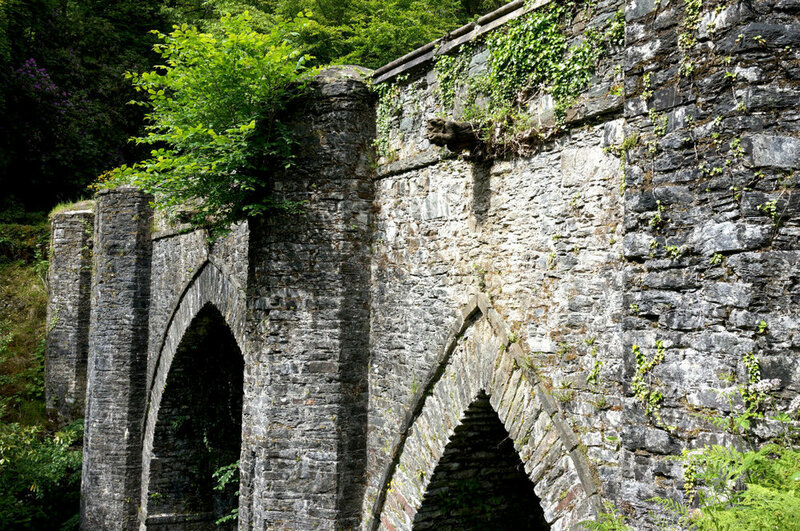 Learn hands-on skills as you join this bridge and castle conservation project and help save the historic bridge and other structures on the grounds of Dunans castle. Conservation at Dunans is underway thanks to a high-energy group of AiP jammers. September volunteers were superstars, completing major repairs on both the historic stone steps and upper bridge walls. This is only the beginning for this valuable joint venture in the beautiful western highlands of Scotland. As long ago as 1590, cartographers noted a property on their maps called Dounens. This location became known as Dunans, and beginning around 1725, served as home to the Fletcher clan for over 200 years. Architect Andrew Kerr transformed the Dunans large manor house into a mock castle in 1864. Sadly, this unique and dramatic baronial house was largely destroyed by fire in 2001, leaving only the pre-Victorian west wing intact. Even more significant than the “castle” is the A-listed Dunans Bridge, designed and built by Thomas Telford in 1815. Although the bridge is similar to others constructed by Telford, the three arches, gargoyles and eight hexagonal piers, as well as its sheer height of 16 meters (52 feet), make it unique and of national importance. After the fire, Dunans was purchased by an owner with conservation in mind. Dunans Castle Limited, a Social Enterprise, was formed and published the Conservation Plan for Dunans, covering both bridge and castle. Once completed the castle will be public, with event spaces on the ground floor and self-catering apartments in the upper two floors that will provide a sustainable future for the site. The local community is both declining and aging, and Dunans currently provides jobs for 9 to 12 people, having a direct impact on the local economy. Castle and grounds also contribute to the tourist market, providing a yearly increase in revenue between 5-15%. AiP jammers met many of the visitors as they crossed the bridge to tour the castle grounds. You can take part in a program of hands-on training established by Dunans Castle to provide an invaluable conservation experience. An expert in traditional building is onsite each day, teaching the skills to be used. Under supervision, your newly learned skills are applied to complete much needed conservation work. Dunans is looking for passionate preservationists to take advantage of this training, and this might be the perfect opportunity for you! 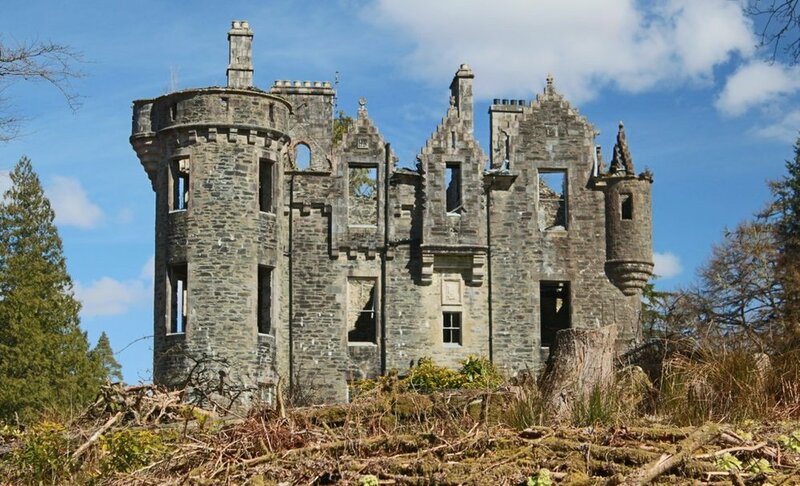 Adventures in Preservation will bring its second group of volunteers to the Dunans bridge and castle conservation effort in 2019. Until the castle shell is stabilized, our teams will address work needed on the bridge and other structures on the site. Each day after a leisurely breakfast, work begins at 9:30am with a discussion of the day’s tasks and demonstration of skills as needed. Tasks may vary depending on which session(s) you attend, and you’ll have the opportunity to learn a variety of skills. There are breaks for tea and lunch; work ends about 5pm. A detailed schedule is provided after registration. Come to Scotland with AiP – travel, learn and preserve as you support this valuable social enterprise! I have so many great memories. I really enjoyed all the people and the personalities. We all got along so well. I loved the castle and even the rain! Lodging is at Glendaruel Lodge and two adjacent cottages, Marjorie’s Cottage and Coach House. Each has its own living area and kitchen, with clothes washer. Cottages surround a courtyard with a giant chess set at its center! The lodge is 15 minutes from the castle and a minibus takes us to and from the work site. A local cook prepares delicious meals, introducing you to local cuisine and produce. Dinners will be served as a group meal in Glendaruel Lodge. Breakfast food is provided for jammers to prepare. Lunch is provided at the work site. Options for vegetarians will be provided upon request. Our hosts at Dunans Castle have planned an entertaining evening at the site. We’ll enjoy a barbecue by the fire pit combined with storytelling of local mythology and derring-do of the glen. The local community is also keen to show us a warm welcome. We’ll spend an evening learning Scottish dance; and a second evening with the community choir to see if we can outdo the 2018 singing jammers. Both are followed by a visit to the local pub. The Dunans Castle staff is planning a fun Wednesday afternoon outing and an amazingSaturday excursion through Argyll. Horseback riding, fly-fishing, photographic hikes and more can be arranged upon request. This experience has left such a huge imprint on my life, and I hope to do more projects. It was an incredible journey that has helped me learn and grow as a person. Your project fee of USD1580 for one week, USD2960 for two weeks, covers the cost of lodging in a double room, meals, excursions (meals on excursions not covered), materials & training, and transportation to and from Glasgow Airport. If you prefer a single room, an additional single supplement will be added to your fee. If flying to the project, the Glasgow Airport (GLA) is closest to the project site. Airport pickup will be provided from Glasgow on Sunday, September 8, and Sunday, September 15. Arrival time must be prior to 4pm on Sunday. Sunday dinner will be the first meal provided at the lodge. Rental cars are available at the airport for those interested in having their own car. Drive time from Glasgow Airport to Dunans Castle is about 1 hour and 20 minutes. Airport drop off will be provided on Sunday, September 15 and Sunday, September 22. Drop off will be at 10:30am. September is the sunniest month in western Scotland, so look for sun and plan for rain.Daytime highs are around 50-60 F, with lows in the mid to upper 40s F. Rain gear is essential. Plan to bring waterproof socks, waterproof/water resistant shoes, waterproof jacket and pants. A waterproof hat may be helpful in addition to the jacket hood. Several sweaters and/or sweatshirts are recommended to go under your rain jacket. Sturdy close-toed shoes are required.